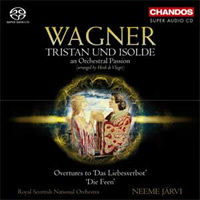 ‘Tristan und Isolde, an Orchestral Passion’ is the third of the Dutch percussionist and composer Henk de Vlieger’s arrangements of a Wagner opera in purely orchestral terms to be recorded by Chandos and, once again, the Royal Scottish National Orchestra and Neeme Järvi do the honours. 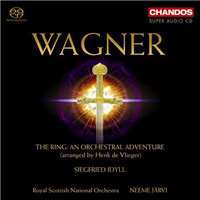 The previous issues were ‘The Ring, an Orchestral Adventure’ Wagner: The Ring - An Orchestral Adventure - Järvi and ‘Parsifal, an Orchestral Quest’ Wagner: Parsifal, an Orchestral Quest - Järvi. De Vlieger’s arrangement of Tristan und Isolde dates from 1994 and was made at the request of the Netherlands Radio Philharmonic Orchestra. It attempts to encapsulate the essence of the opera in a continuous sequence of seven sections totalling on this recording 51’31”, though the score suggests 64’! De Vlieger focuses his attention solely on the opera’s two main protagonists, thereby eliminating music associated with Kurwenal, Brangane and King Mark from the piece. 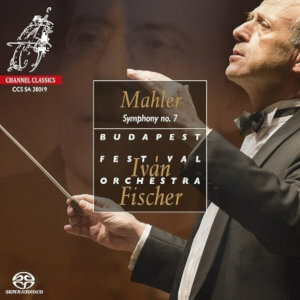 Järvi’s tempo for the Tristan Prelude is indicative of the excessive and idiosyncratic speeds that he has adopted in his recent Bruckner and Mahler recordings, and while many will welcome forward momentum in Wagner performances, his timing of 6’41” for a piece of music that usually lasts around 11 minutes is frankly bizarre and sounds it. Things improve somewhat with the work’s second and third sections entitled respectively ‘Isoldes Liebesverlangen’ and ‘Nachtgesang’. Combined, these two last 24 minutes and represent the bulk of de Vlieger’s arrangement. The first is essentially a compression of the prelude to the opera’s second Act and the subsequent clandestine meeting of the two lovers. Wagner’s imaginative use of off-stage horns in this prelude is magically realised on this recording via the surround channels. ‘Nachtgesang’ represents the love duet between Tristan and Isolde, and here de Vlieger has quite effectively used a solo violin and clarinet to represent the missing vocal lines. Following the Prelude to Act 3 (section5), the final three sections ‘Tristans Vision’, ‘Das Wiedesehen’ and ‘Isoldes Liebestod’ compress the events of the final act up to its transcendent conclusion. 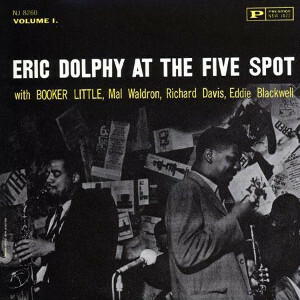 Throughout one is transfixed by the beauty and richness of the orchestral playing so vividly captured on this recording. 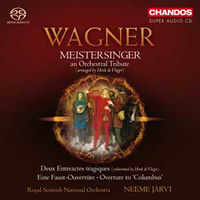 The overtures to Wagner’s first two operas ‘Das Liebesverbot’ and ‘Die Feen’ make most attractive companions to the main work, the former making its first appearance on SACD and Järvi’s performances of both are almost worth the price of the whole disc. Wagner based ‘Das Liebesverbot’ on Shakespeare’s ‘Measure for Measure’ and few would recognize this rumbustuous overture with its use of castanets, triangle and tambourine as the work of Wagner. Järvi and the RSNO play it for all it is worth with no holes barred and the result is frenetic, but absolutely thrilling. 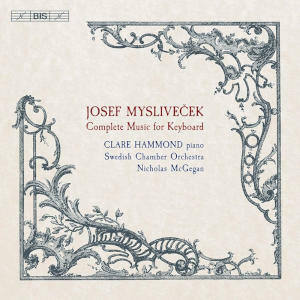 Those seeking a performance with a touch more grace and decorum should try Sawallisch in his complete recording of the opera on CD, but would probably miss the adrenalin rush that Järvi generates. Surprisingly it is the overture to Wagner’s first opera ‘Die Feen’ rather than ‘Das Liebesverbot’ that presages the Wagner to come. 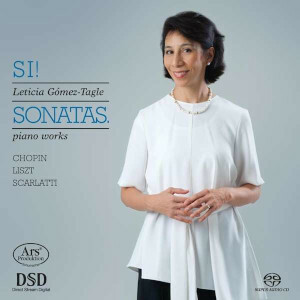 Hints of ‘Lohengrin’ abound in the martial music, and in the final pages there is a clear evocation of ‘Elizabeth’s Greeting’ from Tannhäuser. As in the previous overture, Jarvi pushes the players of the RNSO to their limit in the fast music, but the result is undeniably exciting. 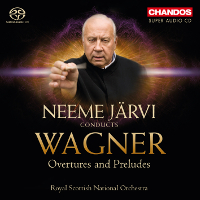 Whatever reservations one might have about de Vlieger’s arrangements and Järvi’s hyperactive performances on this SACD, there are none with regard to the sound quality. The Chandos 5.0 DSD recording is excellent; capturing the sterling qualities of the RSNO’s playing in a sumptuous acoustic most appropriate for this music. Purists of a Wagnerian persuasion will probably hate this disc but many others will find it a lot of fun. Those who enjoyed Järvi’s accounts of the previous two de Vlieger arrangements listed above will need little encouragement to try this one. This disc opens with the overture to Das Liebesverbot (Forbidden Love), an early opera dating from 1834-6 based loosely on Shakespeare&apos;s Measure for Measure, is a work that is entirely uncharacteristic for the Wagner that most will know. It starts (and they return many times) with a prominent part for castanets and the character of the music is such that it wouldn&apos;t be out of place at the New Years Day concerts in Vienna! The playing of the Royal Scottish National Orchestra and conducting of Neeme Jarvi wouldn&apos;t be out of place there either, electrifying stuff played with enormous verve and panache. The overture to Die Feen (The Fairies) is an even earlier work of 1833-4 and has an obviously Mendelssohnian character, although hints of Wagner&apos;s more mature tonal and melodic language are straining to escape. Like the other overture, the playing and conducting cannot be faulted and is another highly enjoyable performance even if it lacks the special feeling of Das Liebesverbot. The main work is Henk de Vlieger&apos;s 1994 arrangement of Tristan and Isolde, now called Tristan und Isolde - an orchestral passion. It contains most of the key musical moments and de Vlieger very skilfully dovetails all the sections together: the Einleitung to Act I (better known as Prelude/Vorspiel - presented untouched except for the last few bars for transition purposes), Isolde&apos;s Liebesverlangen in Act II, Nachtgesang in Act II, Vorspiel und Reigen from Act III, Tristans Vision from Act III, Das Wiedersehen from Act III and, of course, Isoldes Liebestod from the conclusion of Act III (again, presented in the standard orchestral form). By and large, the playing and conducting is, like that of the overtures, fantastic - full of atmosphere and drama allied to a gripping sense of forward momentum. The two exceptions to this - which I suspect will be hugely important to many listeners - are the Einleitung/Vorspiel and Liebestod. Here Jarvi propels the music onwards at such terrific pace that one wonders if it is the same masterpiece that the vast majority of other conductors perform. Most adopt a steady quaver pulse (i.e. 6 beats per bar), Jarvi has a flowing 2 beats per bar and it is a wonder that so the Royal Scottish National Orchestra manage to play the score so accurately at this tempo. Just for illustrative purposes, here the combined Vorspiel und Liebestod takes just under 12 and a half minutes; on the recommendable Wagner: Tristan und Isolde (highlights) - Deborah Polaski, de Billy has a fairly middle-of-the-pack timing of just under 17 minutes; Karajan on his superb Wagner excerpt collection on DVD-A (I know, I know) sustains, thanks to his wonderful orchestra, a time of 19 minutes and from his complete set of around the same period, 20 minutes. Jarvi can thus be seen to be nearly twice as fast as one of the greatest ever readings of this score and half-as-fast again as de Billy&apos;s reading. 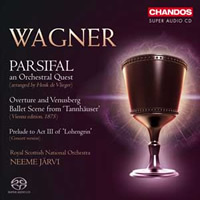 Despite the marvellous work elsewhere in this "orchestral passion", many will feel that this is a travesty of the intense ardour that Wagner evokes in his score and is more accurately described as teenage lust. 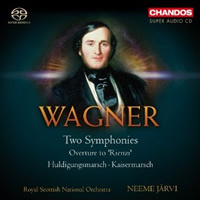 The sound is one of Chandos&apos; best recordings and certainly the Royal Scottish National Orchestra sound magnificent and every inch an opera orchestra. Particularly effective in MCH is the atmospheric placing of the off-stage horns in the Nachtgesang from Act II - they convey a stunning sense of distance that is rarely achieved in the opera house. If one is prepared to accept the astonishingly quick Vorspiel und Liebestod, then this is an eminently recommendable disc; it&apos;s probably worth it for Das Liebesverbot alone!